Power couple, Beyonce and Jay Z flaunted their love for each other at the New Jersey leg of their On The Run II on Thursday night. The 36-year-old singing sensation and her rapper husband shared a kiss on stage during their performance. 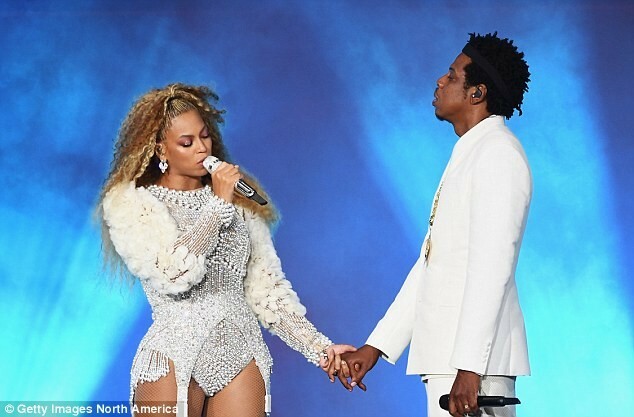 For the performance, Beyonce donned thigh-high boots and a jewel-encrusted bodysuit, while Jay was in a 70s-style suit and a large pendant necklace hung from his neck. The singer later changed into a range of eye-catching ensembles, including a dazzling gold plunging mini dress. Her husband also changed into different ensembles for their joint performance.